Food served Pizzas can be ordered Mon–Sun 5–10pm. Smart, comfortable bar with the added bonus of pizza from local Italian, Origano. 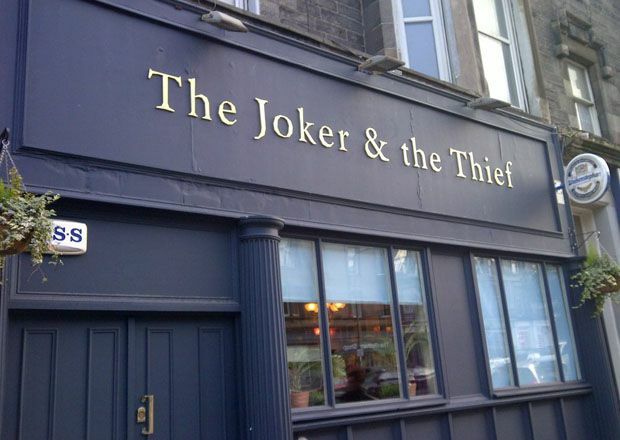 The arrival of the Joker and the Thief in what used to be the Brunswick Lounge is yet another example of the Leith Walk area sprucing itself up. Musical links extend beyond the bar’s name (based on a Dylan lyric) to the décor, with dozens of framed prints of iconic musicians covering the walls. There are eight draughts, plus a further two hand-pumped beers on rotation (usually listed on the blackboard outside). When combined with another 30 to 40 mainly Scottish craft beers and ciders in the fridge, you shouldn't struggle for choice. There’s no menu but pizzas from nearby Origano can be ordered at the bar. The snug area at the back can be hired for free and although dogs are welcome, your kiddies are not. Some traditions don’t change.